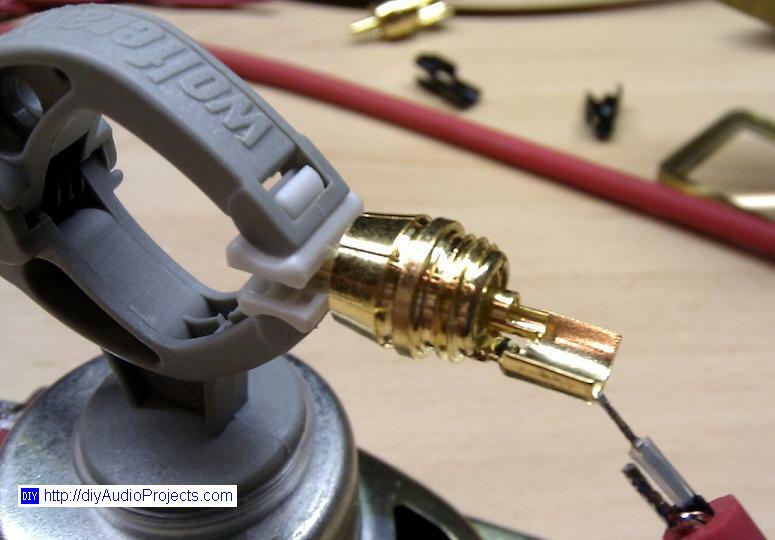 This project is a guide to build your own simple high quality RCA interconnect cables for your Hi-Fi audio system. 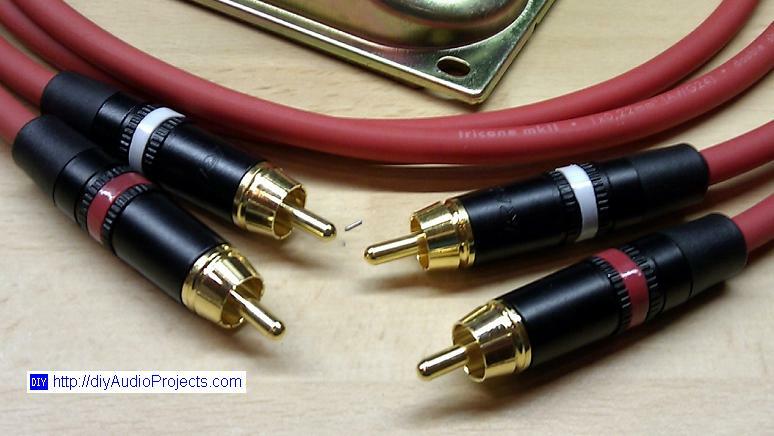 These "better DIY RCA interconnects" are unbalanced and made using shielded instrument cable and high quality RCA plugs. 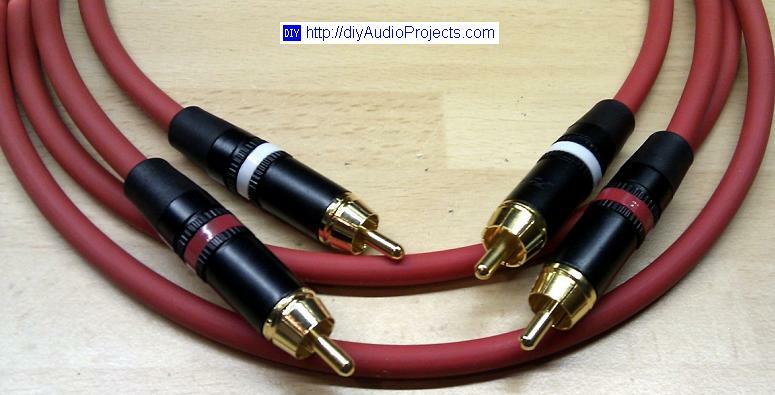 This is a fairly easy DIY cable project and one stereo pair of DIY interconnects can be put together in about one hour. You will not need any fancy materials or special tools to build this cable. Just some meters of good shielded instrument cable and high quality RCA connectors, a soldering iron and some good solder with flux, a handy knife and a good side-cutter to prepare the wires for the soldering process. This cable project was made for the reason that I did not like my stock interconnect cables any longer. I always had the bad feeling that the stock interconnects picked up some noise and the sound seemed a little "pressed" to my ears. Thus, I decided it was time to try some new interconnect cables. After gathering some information and reading a number of opinions and experience I decided that I would use instrument cable. Instrument and microphone cable must provide a very good shielding to block noise and radio frequencies (RF) and it is designed to deliver a wide frequency band. This makes a lot of sense as instrument cables are used with guitars, microphones and studio equipment. Why should this not work for interconnects? That was the quest(ion). I used about 5 meters of Sommer Cable "SC-Tricone MKII" (AWG #24) to make 2 stereo cable pairs, each interconnect cable is about 1 meter long. The SC-Tricone MKII cable is very flexible and soft due to its "Skin PE" material. 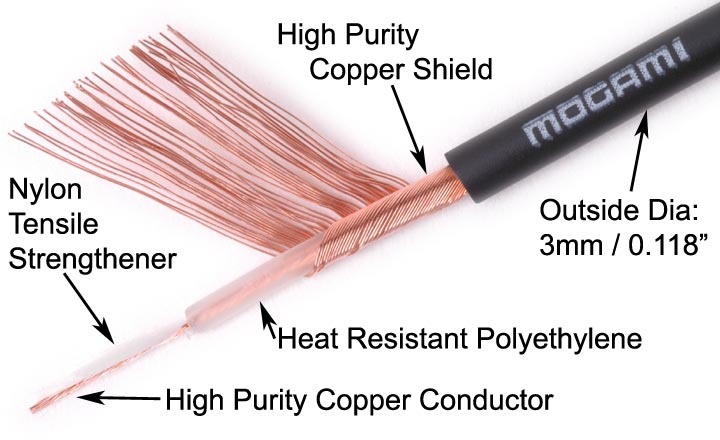 It comes with a double shielding, made of the copper conductor and one additional layer of carbon coated shield material which is softly bound to the signal conductor insulator. The SC-Tricone MKII cable cost me 4.3 Euro for 5 meter. The Tricone MKII cable is made in Germany comparable to the Mogami 2319 - AWG#23 or the Prefer MGK-16 - AWG#22. Mogami and Prefer cables follow the same build principle and they are also a good option. You should be able to find Sommer, Mogami, Prefer or another suitable cable at your local instrument store. The Mogami W2330 interconnect wire (less than $1US / foot) also looks like a good wire choice for this project. I ordered Rean NYS373-2 RCA Plugs (made by Neutrik Company) which are black in color and with red and white indicator rings. 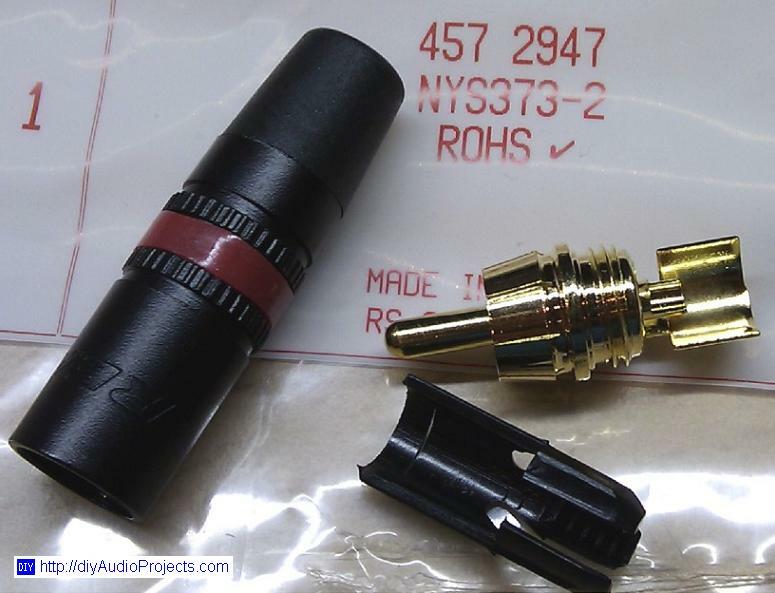 The Rean NYS373-2 RCA connectors ($1.39US each) have gold plated contacts and rubber end-boots to firmly hold the wire in place. These Rean RCA connectors come with a variable inner strain relief for cables with an outer dimension of 4mm to 6mm. 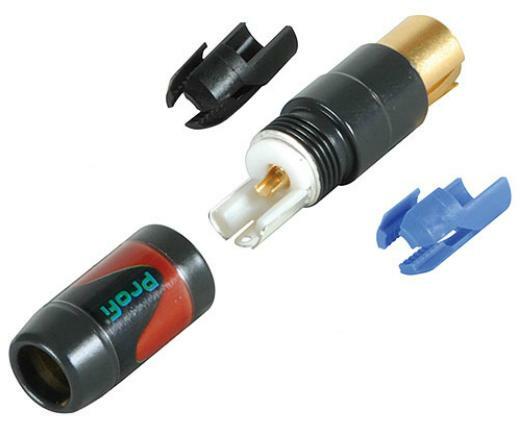 I did not want to buy some extraordinary RCA plugs, because the Rean NYS373-2 RCA Plugs are very good quality connectors. Another viable option for those interested in a higher quality plug is the Neutrik NF2C-B/2 Profi Professional RCA Plugs . The Neutrik Profi plugs are really excellent quality connectors, but you will have to dig a little deeper in your wallet as the plugs are $16.19 a pair. Gio the editor of diyAudioProjects.com really likes the Neutrik Profi RCA plugs and uses them for his cables. 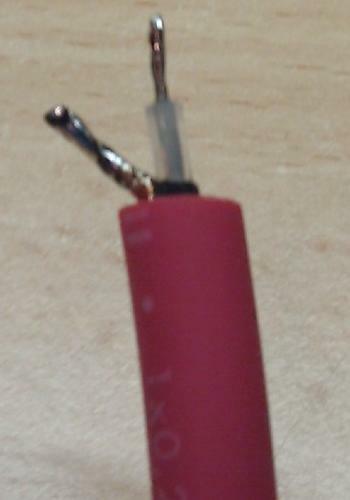 Due to the softness of the outer skin it was not very easy to strip the cable from the start. I used an older kitchen knife (which was not very sharp) to cut the outer skin and to strip it. After stripping the outer skin I tied the copper shield conductor back to get access to the second black compound shield. The second shield is bound to the inner PE isolator and contains the signal conductor. The compound shield can be pulled off easily when you scratch it a little with your finger nails or you can score the shield with the back of a knife. The insulator is very soft and a little sticky. Once one edge is pealed, the rest comes off with ease. This method worked very well and did not damage the conductors. 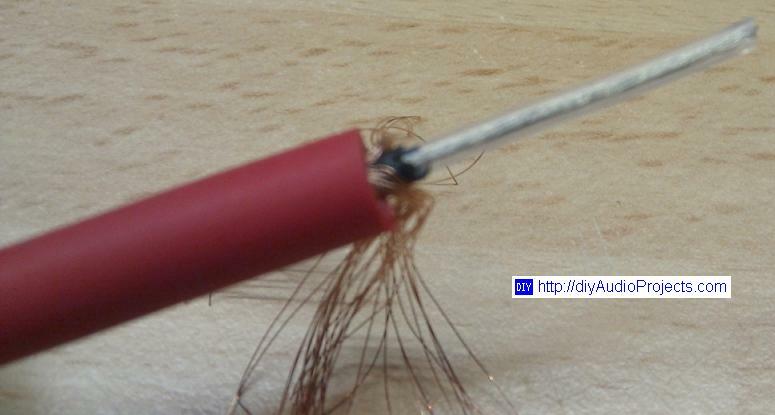 With a little patience and trying you will get the feel how to best prepare your wire. 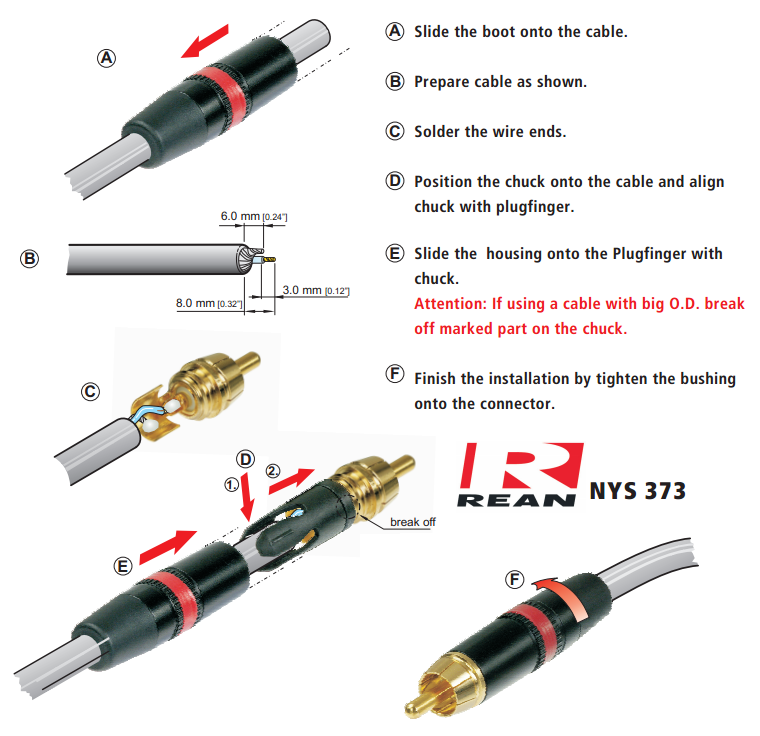 Figure 1 shows the assembly instructions for the Rean NYS373-2 RCA Connector Plug provides a clear guide for assembling the connector plugs. Please take some time to read the instructions. This will help you a lot with the assembly! The instructions also show how to prepare the plugs for 4 mm or 6 mm cables. NOTE: - It is very important to slide the plug housing over the cable before you start to solder the wire to the connectors !! Below are some photographs showing final assembly of the RCA cables. Refer to Figure 1 for a detailed assembling guide showing for the RCA connector plugs. A "third hand" helps make the job of soldering the wire to the RCA connectors much easier. I must admit that I never really believed that the cable quality could change the sound from my Hi-Fi system. The new set of interconnect connects are a real improvement in my opinion. The noise floor is much lower now (tested with speakers at full volume with non shorted ends and oscilloscope). I can also say that the mids and highs are more clear and I think also more detailed. This was tested using 2 speakers next to each other. One channel connected with one stock interconnect and one channel with one DIY interconnect cable. I switched between the two channels to check for a difference. The signal was a mix of repetitive audio snippets, converted to two channel mono using Audacity. 5 and 10 seconds on left channel and then on the right channel was played through a LM3886 chip amplifier. It was a little tiring, but this worked very well. The speakers I used were the Klipsch RF-62 series II which are very sensitive speakers. The measured the capacitance of the new DIY interconnect cables is 28 pF/m. The old cables I was using were 56 to 62 pF/m. I can not measure the inductance (no LCR meter), but the inductance does not matter with interconnect cables (only with speaker wire). These new DIY interconnects are clearly much better. The total cost per cable pair is quite low at about $10, but the sonic gain is high. 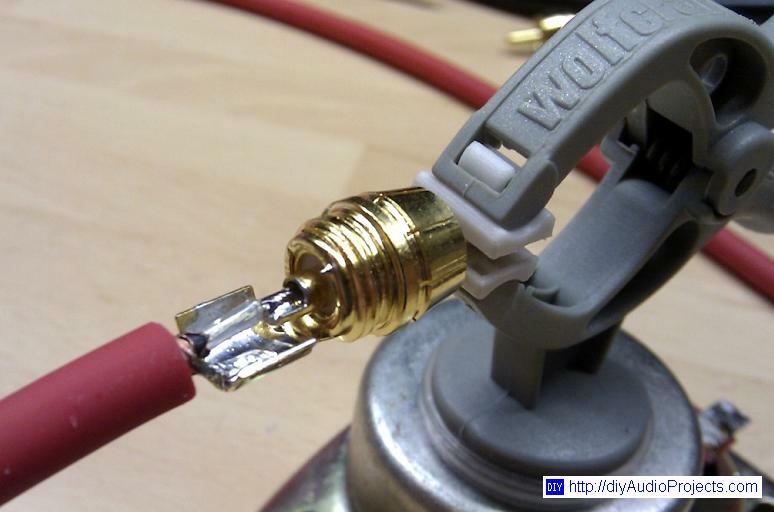 If you are on the fence about trying a DIY cable, this is definitely one worth trying. The cables are very simple to make and don't cost much. These are not super high-end or voodoo style interconnect connects. I just think they are a significant step-up compared to "stock" and other inexpensive interconnects. Questions ans comments about this DIY cable project are welcome in the forum thread Interconnects made of instrument cable - good or not?